Floras Lake House Bed and Breakfast is located on the Southern Oregon coast, 17 miles south of Bandon, Oregon, on Floras Lake. All four guest rooms offer beautiful views of both the lake and the vast Pacific ocean. Come stroll the beach just over the sand spit that separates fresh water Floras Lake from the Pacific. 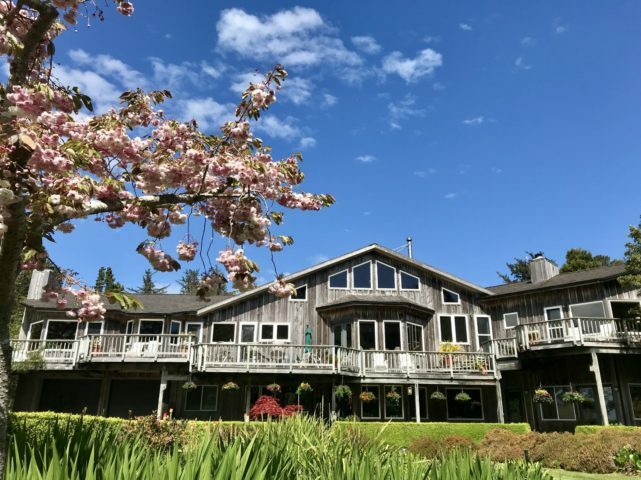 Built with you in mind, the B&B opened 28 years ago so that the innkeepers could share with others the beauty of the Southern Oregon Coast. Stroll their lovely gardens, walk to the beach and hunt for agates, hike the amazing ever-changing trails of Floras Lake State Park nearby, or just relax on our sunny, wind-protected decks. Four guest rooms await, 3 with king beds and one with queen and twin. All rooms enjoy wonderful views of the lake and ocean, private baths and high wood ceilings, two have tiled fireplace. A full buffet style breakfast is served with a different hot dish each day. Local jams and Innkeeper Liz’s homemade granola are always a popular choice!